Explore and improve your singing - in private lessons. I am also available to teach music theory, playing by ear & learning to improvise (any instrument), or beginning piano. Are you looking for ways to bring peace to your emotional life? Do you want to find more joy and fulfillment in your daily living? Would you like less confusion and more clarity? Let's talk. Most of us think we want answers. But life is ever-changing and the answers keep changing as you do. What we really want is to ask higher quality questions, and in the asking, we discover the answers that are inside you. I don't approach life from a standard, one-size-fits-all perspective. I am looking for deeper truths and more satisfying ways of being.... and I think you are, too. I am willing to serve you as an active listener, a compassionate guide, and a open-hearted reflection on your search. 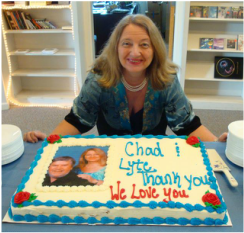 ​Some of Lyte's songs and Choral compositions are published by Heartwind Music. Spiritual Workshop: "Sweep the Cobwebs From Your Mind"
We take form in a body to learn and grow on this paradise called planet earth. How do we get back in touch with the wonder and beauty that is all around us? How do we remove the blinders that keep us from the seeing the Light in every soul? How do we sweep the cobwebs from our mind to recognize the ever-present outworking of spirit? This light-hearted presentation includes lots of original music (and sing-alongs), discourse, a short meditation, and dialogue. How Do You Let Go of the Suffering of Others? Lessons from the Garden - a series of columns exploring the lessons of life and Spirit as I reflected upon them in my garden.